Found on the banks of streams, in deciduous woodlands, in the western USA, Darmera peltata (Indian Rhubarb) is unusual in that it begins flowering on tall stout stems before the leaves emerge. 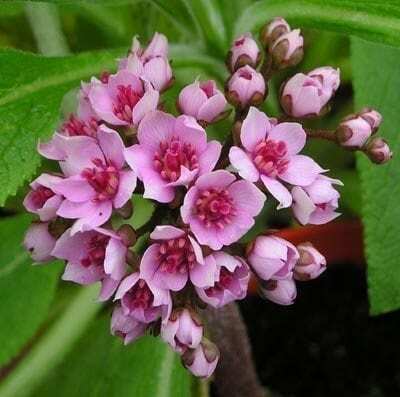 The flowers are pink with white or pale pink petals and the leaves peltate, glossy green above, turning purple during autumn. It associates particularly well with Rodgersia, Astilbe and Gunnera in a waterside setting and is best grown in a moist soil. Hardiness rating H6. Simply remove old flowers and stems in autumn. Can be propagated from seed, but it is just as easy to divide the woody rhizome in spring. We use an old saw as they are quite tough!